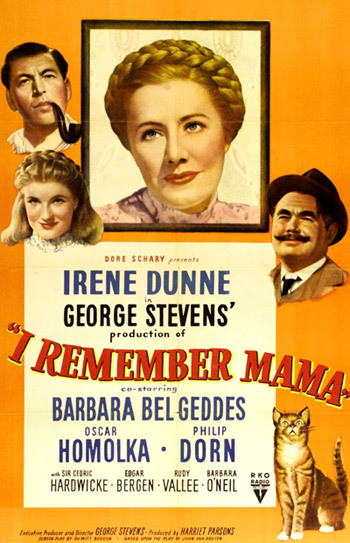 I Remember Mama (1948) is a sentimental and nostalgic post-war favorite, with DeWitt Bodeen's screenplay loosely based on Kathryn Forbes' book Mama's Bank Account - it was the winner of five Oscar nominations (remarkably, four were for acting roles). The revered family classic, from director George Stevens, was also based on the original 1944 Broadway play written by John Van Druten, and produced by Rodgers and Hammerstein. The film's success led to a popular Lux Radio Theatre show in 1948, the best-loved early CBS-TV sitcom titled Mama (from 1949-1957) with Peggy Wood as Mama, and the "ITV Play of the Week" in 1961. The story, a series of vignettes, was about a middle-class Norwegian immigrant family living on Larkin Street in San Francisco at the turn of the century. The family was held together by a stern, resourceful, untiring, protective and loving matriarch, Marta "Mama" Hanson (Irene Dunne), and her blustering husband Lars "Papa" Hanson (Philip Dorn). Family life was recalled in flashback style from the diary of the oldest daughter, Katrin as she narrated and read from her recently-written autobiographical novel. Katrin had just finished it, typing THE END. She stretched back and then took the many pages in her hands, and began reading from its start. The famous quote: "But first and foremost, I remember Mama" (the conclusion of the book's introduction) was heard. A Novel, by Katherine Hanson. For as long I could remember, the house on the Larkin Street hill had been home. Papa and Mama had both been born in Norway. They came to San Francisco because Mama's sisters were here. All of us were born here: Nels, the oldest and the only boy, my sister Christine, and the littlest sister Dagmar. But first and foremost, I remember Mama. (looking up and reminiscing) I remember every Saturday night, I would sit at my desk by the attic window and write down in my diary all my innermost thoughts. Mama would call out to me from downstairs...It was like a weekly ritual those Saturday nights, for I remember how Mama would sit down at the kitchen table, and count out the money that Papa had brought home in a little envelope. As she lovingly remembered, Mama struggled daily with the finances to seek a new and better life for the family members, living in an unfamiliar land. There was also impoverished boarder Mr. Jonathan Hyde (Cedric Hardwicke). Incidents included preparing the weekly financial budget at the kitchen table (with Mama's familiar relief: "Is good - we do not have to go to the bank"), Mr. Hyde reading of classic novels to the family each evening, Dagmar's operation, the sickness of the household's cat Uncle Elizabeth, the death of Uncle Chris, and Marta's encouragement of Katrin to aspire to be a writer.